Tánh Linh has a total area of 117,422 ha and is situated in Bình Thuận province 150km north of Ho Chi Minh City bordering with Dong Nai province and between Đức Linh and Hàm Thuân Nam districts. The inhabitants are mostly economic immigrants coming from poorer regions of Vietnam. Ethnic minority groups including Tay, Thai, Muong, Nung,Gia rai, E de, K’ho, Cham, Chơ Ro, Dao, Raglai, Xtieng represent approx 13.5% of the population in Tánh Linh. Two decades ago, the area was a rainforest and thinly populated; but today the population amounts to approximately 105,408 people (2014 local government figures). The 2014 average income in this district of 1,602,000 VND (US$ 77) is well below the national average of 3.8M VND (US$183) per month. The main resources of this region are: rice, fruit trees, livestock. The reasons for poverty are many: lack of capital, shortage of land for some, archaic techniques, remoteness from the main markets, high inflation rate etc. Many local people rely on farming activities but have recently experienced high losses due to unusual weather changes. Loans from banks or moneylenders are readily available, however the high rates of interest (up to 10% per month) make them unaffordable. Tanh Linh project site is currently providing 1,034 poor households (March, 2017) with micro loans and other services in all 14 communes in Tánh Linh. The impact of this poverty on health care and education is disastrous. Only 1.5% of the population has access to running water and only 35% of households families have a latrine. Water is polluted and the hygiene standard is notoriously insufficient. People are exposed to malaria or dengue fever. Approx. 25% of children do not complete secondary school and although the population is keen for all children to be educated, the high level of poverty is a major obstacle to realising their dreams. Implementation of health awareness programs by Thien Chi staff have successfully and significantly reduced the rate of worm infestation from 90% to just 16% over the past 3 years. Thien Chi has established a unique partnership with The People’s Committee and the Women’s Union who are both competent and motivated to implement change for the better. This relationship is a key factor in implementing successful projects in Vietnam. Đức Linh is a highland district of Bình Thuận province located 150 km north of Ho Chi Minh City and borders Dong Nai province to the south. It has a total land area of 53,491 ha and a population of 130,766 (2014 Government Survey) living in 83 villages in 13 communes of the district. Residents are mostly immigrants from the poorest regions of Viet Nam. 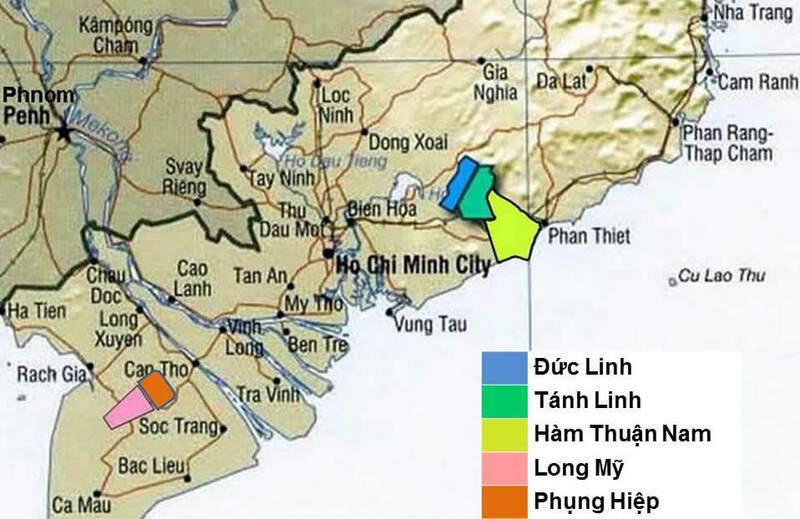 Besides Kinh group, Đức Linh also has 13 different ethnic minorities scattered in the whole district including K’Ho, Chau Ro, Tay, Nung, Muong, Hoa. The 2014 average income of 1,500,000VND (US$72.10) in this district is well below the national average of 3.8M VND (US$183) per month. Duc Linh project site currently providing 1,226 poor households (March, 2017) with micro loans and other services in 11 communes in the Đức Linh. Its main resources include rice, fruit trees, livestock, and fishing for people living near La Nga River. The causes of poverty are many: lack of capital, lack of available cultivated land, very old and backward agricultural techniques, and the remoteness from urban areas. The high level of poverty has a negative influence on the health and education in these communes. Households do not have access to running water and only 36.9% of families have toilet facilities. Water is contaminated and the sanitation standard is very poor. An initial survey indicated that 90% of the population was infected by helminths (parasitic worms) but following an eradication and education program implemented by Thien Chi and the district Health Department, the rate of infection has now significantly reduced to 9%. Other successful initiatives have resulted in a major reduction in the number of malaria and dengue fever cases. Approx. 25% of children give up their rights to a higher education even though their parents are very enthusiastic for them to continue. Families often cannot afford the school resources, or the children are required to work to help supplement the monthly income. Thien Chi has been working in Đức Linh for many years and has established excellent working partnerships with the local People’s Committee, Women’s Union, Health and Education authorities. As a result, programs implemented by Thien Chi here are well regarded and officially recognized by local communities and relevant authorities. Hàm Thuân Nam is situated approximately 200km northeast of Ho Chi Minh City. It has a large area of approximately 105,183 ha with a total population of 113,944 (2014 government survey). This is an agricultural area where dragon fruit is the principal crop and 80% of the people are farmers. The 2014 average income in this district of 1,991,600 VND (US$95.75) is well below the national average of approx. 3.8M VND (US$183) per month. Ham Thuan Nam project site currently providing over 630 poor households (March, 2017) with micro loans and other services in all 13 communes of this district. Hàm Thuân Nam is a district with a big difference between those living in poverty and those considered to be well off. The latter have the capital to grow the renowned dragon fruit successfully, but there are many households still living in poverty with no capacity to sustain a reliable income. The ethnic minority peoples of Raglai, Cham, K’ho who often live in relatively isolated communes, represent almost 4.83% of the total population in Hàm Thuân Nam and are particularly prevalent to living below the poverty line. Completing a school education is promoted and given a high priority by Thien Chi. Approximately 20% pupils ‘drop out’ before the end of grade 10, giving them little chance of a better future or lifting themselves above the poverty line. Hygiene in many schools is still insufficient. Some have no clean latrines, a well or access to a clean water supply. Some kindergartens still have no toilet facilities. Many people are still believed to be infested by worms, however, Thien Chi ‘s health & hygiene training is helping to alleviate this problem.. Thanks to our Integrated Approach, the risk of malaria and dengue fever has been significantly reduced with only a small number of ethnic minority villages still without mosquito nets. Hàm Thuân Nam project site has a team of staff, village workers and community partners who know the area well and have a strong long term commitment to the region. We value our partnerships with the local People’s Committee, Women’s Union, Health and Education authorities in implementing successful projects in this district. Our major challenge is to increase the earning capacity of the extremely poor households who have insufficient resources to grow the profitable dragon fruit. Thien Chi is today implementing all programs in Bình Thuận province. This province was initially chosen in 1993 because local authorities showed exceptional motivation and interest in inviting Non-Governmental Organizations to work in the province. The present Thien Chi senior cadres have now accumulated a huge experience and credibility in the region with local authorities and many communes. With an increasing ethnic minority population and high level of poverty, Bình Thuận province has limited support resources to cope with the huge need in the local communes. In partnership with local authorities, Thien Chi provides this support offering hope for a better future to 38 communes in 3 districts.